This time last week, I was at the final day of three at the World of Coffee Event in Dublin. I’d never been to World of Coffee before, although I’d toyed with going in previous years. In 2014 it was in Rimini and last year, Gothenburg was the host. In both cases, they fell in the middle of busy summers: last year, for example, I was in Portland on the final leg of my coast-to-coast trans-USA trip. This year, it at least fell on dates that I could attend. With my new, flexible job (I don’t need to been in an office on a day-to-day basis) going was a distinct possibility, so I took the World of Coffee being (practically) on my doorstep as a sign. I booked my ticket, my Ryan Air flight, and an Airbnb (I managed to find one 10 minutes’ walk from the venue) and off I went. Although I was there for all three days, for various reasons, including work commitments, and a desire to see something of Dublin’s coffee scene, I only managed three half-days at World of Coffee itself. However, that was enough to get a feel for what was going on. The World of Coffee was held in the Simmonscourt Complex, at the RDS (Royal Dublin Society) in Ballsbridge, about a 45-minute walk southeast of the centre of Dublin. World of Coffee is like a cross between the London Coffee Festival and Caffè Culture, incorporating the best of both events. It had the relaxed nature of Caffè Culture, but with all the speciality coffee names (and more) that you’d expect to see at the London Coffee Festival. If you’ve been to Caffè Culture, you’ll know what I mean, but if you’ve only been to this year’s London Coffee Festival, it felt more like the new, downstairs section, with the big, well-spaced stands, rather than the existing upstairs sections. 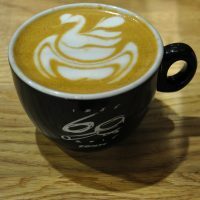 This year the World of Coffee hosted two world finals: the Brewers Cup (which has been at the World of Coffee for the last four years) and the World Barista Championships (which was in Seattle last year and which will be in Seoul in 2017). I had hoped to catch at least some of the finals, but in the end, I didn’t see a single competitor! Since I was only there for three half-days, there was always something else I wanted to do/see. While I recognise the importance of the competitions (for example, I’m looking forward to supporting next year’s Beyond the Bean Barista Bursary), I just don’t find the actual competitions that interesting as a spectator. After several years of mulling this over, I think I understand why. I enjoy watching competitions: the Taster’s Cup, for example, I find compelling: three competitors going head-to-head and, at the end of each heat, there’s a winner. In that sense, the Brewer’s Cup or the Barista Championship isn’t like watching a competition. Instead, it’s a performance, which is then judged. What I’ve come to realise is that I don’t enjoy watching performances, even if I’m fascinated by the subject matter. So, for example, even though I love to dance, I don’t watch Strictly Come Dancing and while I bake every week, I’ve never seen the Great British Bake-off. And so it is with the barista competitions. So, what did I actually do? Well, I wandered around a lot, catching up with various people I either knew would be there or who I bumped into along the way (an increasingly large proportion of my time at coffee events is spent this way!). The equipment manufacturers, particularly those making espresso machines, grinders and roasters (I never knew there were so many coffee roaster manufacturers! ), were out in force. There were also a lot of green bean importers and coffee growers. However, I largely spent my time in and around The Village. This was similar in style and set-up to the Roasters’ Villages at Caffè Culture and London Coffee Festival. It gathered together all the smaller, independent roasters, giving them the chance to exhibit on a (in this case) global scale, but without the expense of a large stand. The Village at the World of Coffee was much bigger than either of its equivalents at Caffè Culture/London Coffee Festival. It occupied one corner of the main exhibition space, consisting of a number of triangular stands, each made up of three tables. Typically, a roaster would just have a table, but some took two or even three to build their own little roaster’s island. While there were quite a few European roasters at this year’s London Coffee Festival, I managed to MISS THEM ALL, something I’m still kicking myself about. So, although various British roasters were out in force, with the likes of Origin, Climpson and Sons, J Atkinson & Co. and Small Batch in attendance, I deliberately made a bee-line for the European roasters and, in particular, the Irish roasters, spending at least 50% of my time in The Village each day. To find out exactly what I did, check out all the kit I found, and see which roasters I met. Let me close by saying that this year’s event was so good that I’ve already pencilled next year (Budapest, 13th -15th June 2017) into the diary. Sadly I never did make it to Budapest, work sending me to Vietnam instead. However, I did make it to World of Coffee 2018 in Amsterdam. See what I made of it here. This entry was posted in Dublin, Festivals/Awards by Brian Williams. Bookmark the permalink.